The Oceania Football Confederation (OFC) and the Solomon Islands Football Federation (SIFF) successfully secured the friendly match before the Bilikiki departed on Tuesday. The match will take place in Pape’ete at 15:30pm Tahiti time on Thursday (12:30pm on Friday, Solomon Islands time). 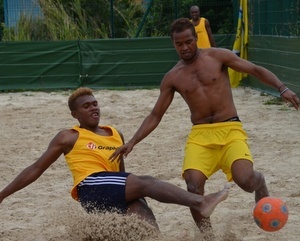 Ukraine enters the 2013 FIFA Beach Soccer World Cup as the third ranked European team. As former European champions they are a formidable force with one highlight being their memorable 2-1 win over Portugal in the UEFA qualifiers for the current beach soccer world cup. SIFF and OFC are continuing to try and organise one more friendly match for the Bilikiki before the competition kicks off next Wednesday. It is felt that two friendly matches will help the Bilikiki to be more prepared for the competition. The Bilikiki touched down in Pape’ete in the early hours of this morning. They will have one training session before meeting Ukraine.